I didn’t take any knitting project with me travelling, and I barely read any of my novels (I brought 2), so I’m quite surprised to be so far along this project (and in my TBR pile). I cast on in early January—or was it late December?—and have been trucking along since then. 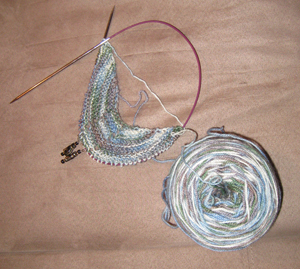 I’m knitting a shawlette called Multnomah. It’s a very popular pattern on Ravelry, and I know several people who have made it and are happy with it. It’s basically a large garter stitch triangle with a feather and fan edge. 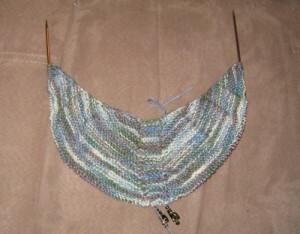 But it works well for variegated yarns like this one. The yarn is from Huckleberry Knits, and hand-dyer in Washington State. Their tagline is “no ugly pooling”. This yarn is a BFL/nylon blend and the colourway is called ‘Snowfall’. I bought it a couple years ago from Apple Yarns in Bellingham. The colours scream “Pacific Northwest” to me and I’m loving how they are spreading out so far. It’s not a colour combination I’d normally choose, but I’m really liking it. I’ve reached the feather and fan repeats now. I loved knitting that pattern! The colorway you’re using is fabulous too. Can’t wait to see it all blocked out and finished. 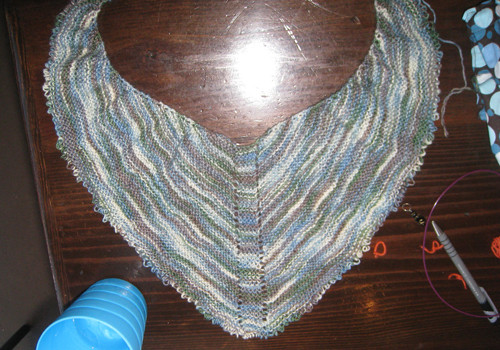 I tried to start this shawl once, but had to give it up…maybe time to try again?